A deep friendship took root between two men in the wilds of Kansas. Their bond spanned the differences of culture and race, and lasted a lifetime. Today we often think of encounters between whites and American Indians on the frontier as tense, even violent. This was not always the case. The likelihood that individuals would get along depended on their personalities and as well as the circumstances under which they interacted. In this regard, Bluejacket and Boles may have been predisposed to friendship. Both men were deeply religious. They fathered large families, and lived respectable lives by European-American standards. Charles Bluejacket came to Kansas as a youth after a treaty with the United States government removed the Shawnees from Ohio and Missouri. His grandfather was the famous chief Bluejacket, and his grandmother probably was white. Charles was familiar with Indian missions, having attended a Quaker school in Ohio. In Kansas, he completed his education at another mission school. He married, became a successful farmer and interpreter for the federal government, and began leading a prayer group. 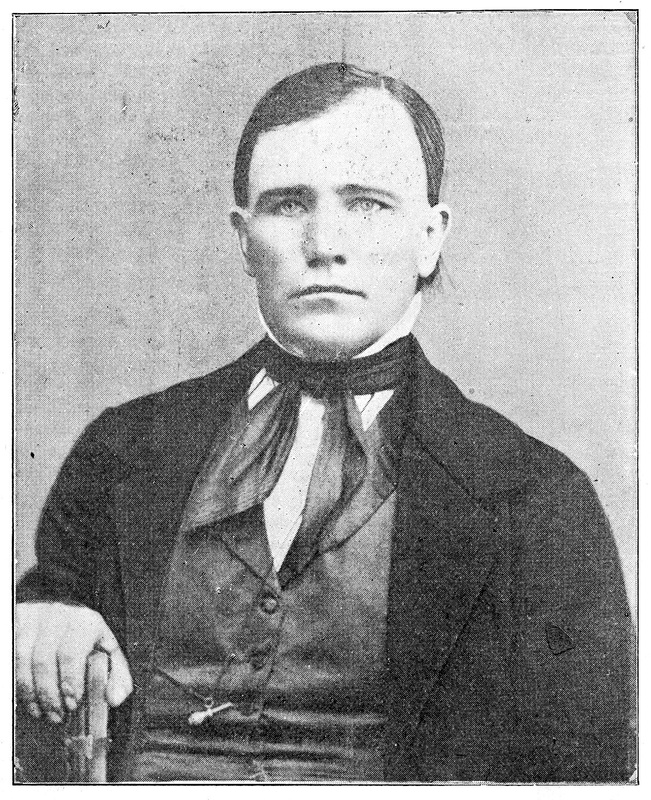 Charles Boles converted to Methodism as a young man in Missouri and was ordained an elder in 1851. The following year he was assigned to the Shawnee Indian Mission School in present-day Kansas City. It was during his six-year ministry to the tribe that he became friendly with Bluejacket. Conditions were primitive at many frontier missions, but not at Shawnee Indian Mission. The Methodist church considered it an exemplary site, as did the federal government (a major funding source). At its height, the mission occupied almost 2,000 acres, much of it farmland. Its grounds had brick schoolhouses and dormitories, workshops, and farm buildings. Because the Methodists used “circuit riders” (traveling ministers) to spread the gospel, Shawnee Mission was Boles’ headquarters, although he spent most days in the field ministering to his flock. Details on the friendship between Boles and Bluejacket are spotty, but the two men obviously saw each other frequently and perhaps even rode the circuit together. One early visitor to the area noted that he met Bluejacket and Boles at another missionary’s home in 1857. The Methodist conference minutes for this time period record that Boles was “assisted” by Bluejacket and others in building the church rolls to about 100 Shawnees. The six years Boles preached to the Shawnee tribe coincided with the Bleeding Kansas era, when violence exploded along the Kansas-Missouri border. It became extremely difficult to accomplish any missionary work. The Methodist conference minutes for this period note, “There was comparatively little done from 1855 to 1865. During these perilous years Bro. Boles stood almost alone.” Almost alone, but not quite. His friend Bluejacket had become an ordained minister in 1859. When war made it impossible for whites to preach at Shawnee Mission, Bluejacket became missionary in charge. 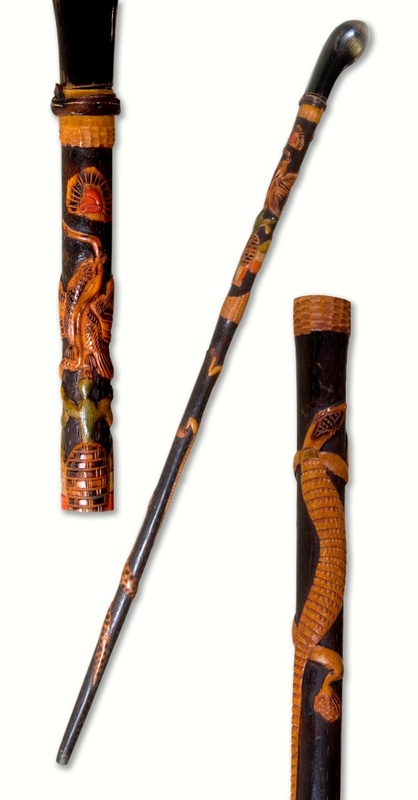 Bluejacket eventually joined his tribesmen in Indian Territory, but before he left he made this elaborate walking stick for Boles. Its carved figures include at least two motifs from the pillars of an early Shawnee council-house in Kansas–a rattlesnake and a turtle, the latter being prominent in Shawnee creation mythology. View a close-up of the turtle carving. The walking stick was passed down in the Boles family until the Kansas State Historical Society acquired it in 2009. It is in the collections of the Society’s Kansas Museum of History.